The Tony Award-winning play "Metamorphoses" is onstage at Arden Theatre Company through November 1. Photo by Mark Garvin. As we morph into fall, enjoy stage classics, contemporary plays, a Sinatra celebration, DesignPhiladelphia Festival, Eastern State’s haunted prison, festivals and much more this week. Robin Bloom shares her picks. DesignPhiladelphia Festival is back with more than 100 events and over 400 local and international designers, architects, and creative thinkers at venues across the city, October 8-16. With the theme of SHIFT, festival programming will explore the shift in design process, organized into six tracks with signature events including the Society of Design Conference, Design Crawl in Old City, and other events including panel discussions and workshops for all ages. New this year, the Pearl Street Passage, a temporary installation from October 8-11 on the 1100 block of Pearl Street in the Chinatown North/Callowhill neighborhood exploring the possibilities for neglected space. Most events are free and open to the public, including the Old City Fest (pictured), October 11, noon-6pm, with live music and performances, design showcase, food and more, Arch Street between 2nd and 4th, and 3rd Street between Race and Market Streets. Presented by the Philadelphia Center for Architecture. Photo by CJ Dawson Photography. 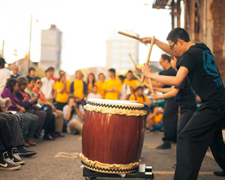 Asian Arts Initiative hosts the 3rd annual Pearl Street Block Party, Saturday, October 10, 2pm-5pm, a free neighborhood festival of arts and community that celebrates Chinatown North/Callowhill as a diverse, creatively rich, and burgeoning cultural hub, and provides an opportunity for Philadelphians to participate in all kinds of interactive art-making. 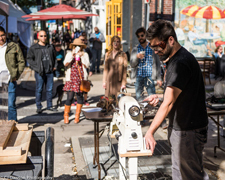 Now a part of the 2015 DesignPhiladelphia, the 1200 block will come alive with a myriad of activities, including live performances, music, activity tables, displays, and interactive artwork by a diverse range of local artists, and Pearl Street Passage, a pop up exhibit highlighting the neighborhood with a weeklong installation of programming and design. Free and open to the public, Pearl Street between 12th and 13th Streets, via Asian Arts Initiative, 1219 Vine Street, Philadelphia. The event culminates in a community feast at 5pm. Photo courtesy of Asian Arts Initiative. 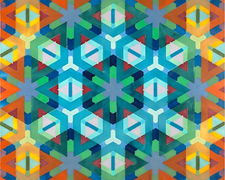 MathThematic: A Fine Art Exhibition opens at Esther Klein Gallery, featuring artists of all media demonstrating evidence of math in art, curated by Gaby Heit. Artists Justin Bean, Regina Ceribelli, William Cromar, Jessica Curtaz, Chris Eben, Robert Fathauer, Karen Freedman, S. Leser, Marco Mahler and Henry Segerman, Gabrielle Meyer, Maximilian Morresi, Brittany Phillips, Bruce Pollock, Mike Tanis, and Andrew Cameron Zahn display pieces including two and three dimensional paintings and drawings, video and interactive works that combine geometry, fractals, patterns and other mathematical principles with visual art, through November 20, 3600 Market Street, Philadelphia. Opening reception Wednesday, October 14, 5pm-7:30pm. Part of DesignPhiladelphia. Pictured: Ruche 0352.32 by Karen Freedman. 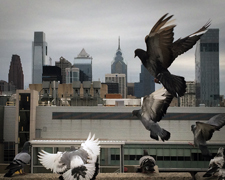 Philadelphia Photo Arts Center, a community hub for contemporary photography, has expanded the annual Philly Photo Day to the Greater Philly Photo Day, Friday, October 9, now including all eleven counties in the region. Take pictures, select your favorite and submit it online to be included in an immense portrait of the Delaware Valley, online and in a gallery exhibit at Crane Arts, 1400 N. American Street, opening November 12. Also, PPAC offers 20 free, 3-hour photography workshops in locations around the region. Submissions must be taken on October 9 and uploaded to the Philadelphia Photo Arts Center website by October 14. Photo by Steve Minicola. Travel from farm to table at the National Constitution Center and discover how world events, innovation, government regulations, research, and economics have shaped what we eat and why with What’s Cooking, Uncle Sam? 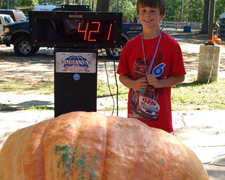 The Government’s Effect on the American Diet. 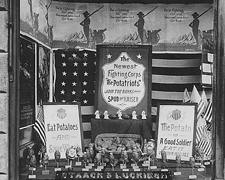 Created by the National Archives Museum, the national tour of the exhibit comes to Philadelphia October 9 and is organized into four themes: Farm includes a musical program in support of the Office of Price Administration performed by Pete Seeger and others; Factory features Upton Sinclair’s letter to Theodore Roosevelt on the hazards of the meatpacking industry; Kitchen with Aunt Sammy’s (Uncle Sam’s wife’s) radio recipes; and Table displaying Rosalyn Carter’s menus for State dinners, through January 3, 525 Arch Street, Independence Mall, Philadelphia. Related programs and events include an evening with health policy expert Ezekiel Emanuel, Wednesday, October 21, 6:30pm. Pictured: Potatriots, ca. 1917-18. 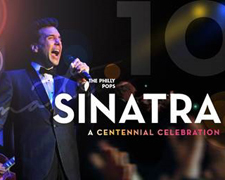 Musical Director Michael Krajewski and the 65 piece Philly POPS orchestra celebrate the 100th anniversary of the birthday of Ol’ Blue Eyes with Sinatra: A Centennial Celebration, October 9-11. Acclaimed singer Michael Andrew sings the favorite hits in four shows in Verizon Hall at the Kimmel Center, Broad Street, Philadelphia. Deana Martin performs Saturday night, October 10, 8pm with her band, remembering her legendary father Dean Martin with his classics in the Perelman Theater. After that performance, the Prime Rib on Locust Street hosts performances from both Michael Andrew and Deana Martin in an intimate supper club setting. 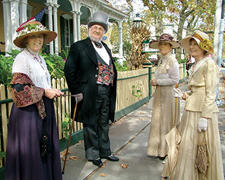 Learn about local Victorian heritage at the 43rd annual Cape May Victorian Weekend, Friday, October 9 through Monday, October 12, as the Mid-Atlantic Center for the Arts & Humanities hosts events including house tours, living history programs, food and wine events, a crafts and antiques show, murder mystery dinners and more in Cape May, NJ. 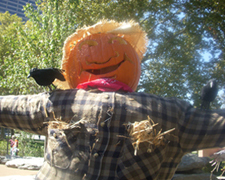 While there, check out “Scarecrow Alley” on the grounds of the Emlen Physick Estate, 1048 Washington Street. Photo courtesy of the Cape May Mid-Atlantic Center for the Arts & Humanities. 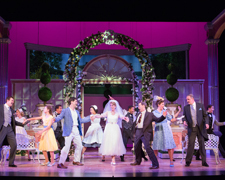 You’re invited to the wedding of the year at Walnut Street Theatre with the Philadelphia premiere of High Society. The Broadway musical comedy based on The Philadelphia Story and the 1956 film musical starring Bing Crosby, Grace Kelly and Frank Sinatra, features Cole Porter’s classic sounds including “Let’s Misbehave,” “Just One of Those Things,” “True Love,” and “Who Wants to Be a Millionaire.” Starring Megan Nicole Arnoldy as the bride-to-be Tracy Lord, a Long Island socialite who, while planning to marry George Kittredge (Jon Reinhold), is disrupted by her ex-husband Dexter (Paul Schaefer). Directed by Frank Anzalone with choreography by Mary Jane Houdina, through October 25, 825 Walnut Street, Philadelphia. Photo by Mark Garvin. 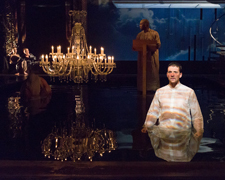 Onstage at Arden Theatre Company is Metamorphoses by playwright Mary Zimmerman. The Tony Award-winning play, adapted and based on the Myths of Ovid, is directed by Doug Hara, a cast member from the original, Broadway and regional productions. A 2600 gallon onstage pool serves as the centerpiece (designed by Sidney Bembridge) for actors Sean Bradley, Krista Apple-Hodge, Leigha Kato, Alex Keiper, Sharina Martin, Christopher Patrick Mullen, Claire O’Malley, Steve Pacek, Brandon Pierce and Lindsay Smiling to use in surprising ways. Enter a magical world where gods and mortals co-exist through November 1, 40 N. 2nd Street, Philadelphia. Special events and performances include post-show discussions on October 14, 18, 21, 25, and 29, plus open captioned and audio described performances on October 23-24. Photo by Mark Garvin. Sophocles’ Antigone takes to the stage at the Wilma Theater through November 8. 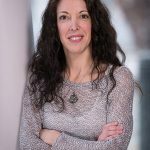 The cross-cultural production is directed by Theodoros Terzopoulos, who chose Wilma’s company after a two-week workshop with the renowned Artistic Director of Greece’s Attis Theater. Terzopoulos’ original adaptation from an English translation by Marianne McDonald (Sophocles translator and Professor of Theatre and Classics at the University of California) merges a physically rigorous methodology with classical text, performed in both English and ancient Greek, and designed to invite conversation around moral, religious and political dilemmas regarding the unburied dead. 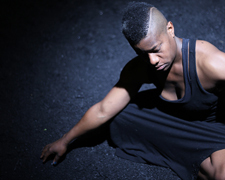 The collaborative show is performed by eight Philadelphia actors and three Attis actors including Ross Beschler, Sarah Gliko, Stathis Grapsas, Justin Jain, Jennifer Kidwell (pictured), Antonis Miriagos, Paolo Musio, Jered McLenigan, Brian Ratcliffe, Steven Rishard, and Ed Swidey. This season marks the debut of Wilma HotHouse, an artist-centric approach where company actors participate in all stages of the creation of the works. 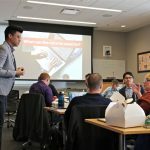 Related programs and events include post-show chats, Young Friends Night, College Night, Beer Tasting, Directors Dialogue, exhibits, and open captioning, and more, 265 South Broad Street, Philadelphia. Photo by Matt Saunders. 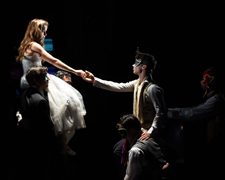 Quintessence Theatre Group, known for adapting epic works of classic literature and drama for the contemporary stage, opens its 6th season with Shakespeare’s Romeo and Juliet, performed in rotating repertory with Machiavelli’s The Mandrake (adapted by Wallace Shawn). Directed by Alexander Burns, both plays feature Alan Brincks, Josh Carpenter, Sean Close, Connor Hammond, Anita Holland, Gregory Isaac, E. Ashley Izard, Emiley Kiser, and Jahzeer Terrell. Post-show talkbacks with the cast and director will take place on October 8 and 18. The Mandrake opens October 14 and both productions can be seen through November 8 at the Sedgwick Theater in Mt. 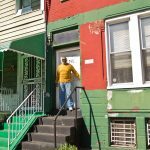 Airy, 7137 Germantown Avenue, Philadelphia. A Pay What You Can preview is October 14 at 7pm. Post-show talkbacks on October 25 and November 5. Photo by Shawn May. Inis Nua Theatre Company continues its tradition of presenting contemporary plays from Ireland, England, Scotland, and Wales with the American premiere of Hooked! by Gilliam Grattan. Fergie’s Pub owner Fergus Carey offered to host the site-specific production at his Irish pub after seeing the show in Ireland. The result is a dark comedy set in a claustrophobic village where nothing is what it seems, Upstairs at Fergie’s Pub, 1214 Sansom Street, Philadelphia. Directed by Inis Nua founder Tom Reing and starring Rachel Brodeur, Corinna Burns, and Charlie DelMarcelle through October 25. Opening night is October 9. Catch “Setting the Scene,” a pre-show exploration of the play’s themes and relevant events with guest theater scholars and practitioners on October 14 and October 21 at 6pm. Photo courtesy of Inis Nua Theatre Company.